Twitter is following in the footsteps of Facebook who naturally followed Youtube in introducing in-stream video ads that will run in content created by Twitter’s partners, including TV networks, sports leagues and news outlets. Video has become a much bigger part of Twitter’s ad revenue base growth as they continue for profitability, and these new video ads will be more familiar to marketers that run commercials on television. The new in-stream ads will be introduced in two ways which include both pre-roll and mid-roll ads. The ads will appear in Twitter’s premium content offerings, which are promoted on the social site. “In recent experiments, we've been automatically promoting videos with high engagement from select publishers. Not only does this drive more views for the publisher, but it also allows advertisers to get their message in front of a larger target audience. We have seen early success in the US and look forward to rolling this out more widely in the year ahead,” said Mo Al Adham, senior product manager, revenue, at Twitter in a blog post. How effective will Twitter ads be for brands? 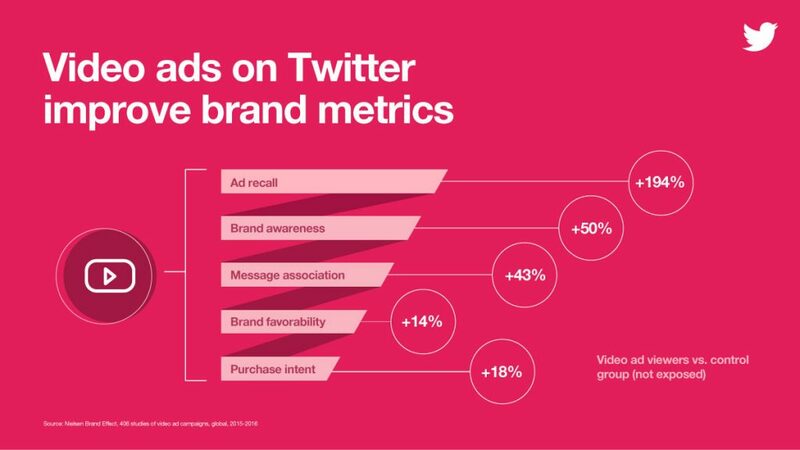 Twitter has done brand effectiveness studies with Nielsen and found that people who saw video ads on Twitter were 50% more likely to be aware of the advertiser’s brand, felt 14% more favourable about the brand, and had 18% higher purchase intent, compared to those who had not seen the ad, Al Adham said. The company said it will make investments in related technology with an aim to offer enriched experiences for consumers, publishers, and advertisers. It will announce more details on the initiative during the Digital Content NewFronts in New York scheduled for May 1. While Twitter’s move to invest in technology appears positive, it comes on the back of a spate of problems faced by other leading online video platforms, such as placement of pirated content and inappropriate or offensive videos. Alphabet Inc.'s Google faced suspension of ads by prominent advertisers like ATandT Inc., Verizon Communications Inc. and Johnson and Johnson as they claimed that their ads were appearing alongside YouTube content that promotes terrorism and hate. Twitter in-stream could provide an alternative for scoured brands or brands now sceptical of Google right into arms of Twitter. Twitter would also probably provide favourable ad rates to attract brands and making it more attractive offering. As online attention spans shorten and promotion fatigue sets in users are always looking for new ways to be stimulated and of course new ways to be convinced that they need to make purchases. Coupled with the improvements in technology video content and more importantly, video advertising has seen a major growth in popularity. Brands will continue to pour money into video marketing and popular media platforms from Facebook, Youtube to Netflix will continue to drive the value for the customer and relevance for the brand.